A lonely 98 mile route linking one empty area of Nevada with another, NV 375 has become internationally known after being designated, in 1996, the 'Extraterrestrial Highway' on account of the high incidence of UFOs seen in the skies above. 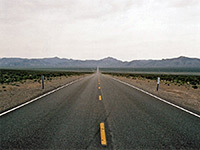 The road is also notable because of its proximity to the vast Nellis Air Force Base, which contains the Nevada Test Site, where many top secret missiles, aircraft and weaponry have been trialed since the 1950s, though the fame is due in particular to one small part of the base, the mysterious Area 51. This is a parcel of land just 10 miles by 6 miles, near the dry bed of Groom Lake, and associated with one or more of the most secret research projects, alien landings, flying saucers, and assorted conspiracy theories about UFO cover-ups. Activity from the nearby testing range would of course explain all the UFO sightings along highway 375. 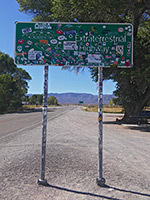 The south end of the Extraterrestrial Highway is at the scruffy village of Crystal Springs, on US 93, which in contrast to the surrounding barren sagebrush desert, sits in the middle of a small, well watered zone of trees, bushes, streams and marshes - the Key Pittman Wildlife Management Area. NV 375 heads off to the southwest, across a valley and into the foothills of the Pahranagat Range, peaking at Hancock Summit (5,592 feet), soon after which a long dirt roads forks left, towards the next range of hills in the distance. This leads, after a few miles, into the Nellis Base and directly to Area 51, but don't even think about driving along here. The ET Highway turns northwest and starts the first of 5 sections which are dead straight for over 10 miles. The barren hills and valleys to the north are part of the BLM-administered Basin and Range National Monument, established in 2015. After climbing over a low ridge, past Coyote Summit (5,966 feet), the road passes the tiny village of Rachel, the only settlement en route, and which consists of just a gas station, a church, a cluster of houses and a restaurant/motel/gift shop - the Little A'Le'Inn, trading almost exclusively on the passing UFO tourist traffic. The town was named after the first child to be born here, one Rachel Jones in 1977, though she survived for only three years. Past town, the next long straight is followed by another low range of hills, then the highway enters the 10 mile wide Railroad Valley, empty except for scattered Joshua trees, and large expanses of salt flats in the middle. A side road to the right leads, amongst other places, to the Lunar Crater Volcanic Field. Finally, road 375 turns due west, through the Reveille mountain range and meets US 6 at Warm Springs, an abandoned village at the site of a desert oasis.